Smelleze™ Formaldehyde Odor Neutralizer Granules: 2 lb. Smelleze™ Formaldehyde Spill Absorbent Granules: 50 lb. 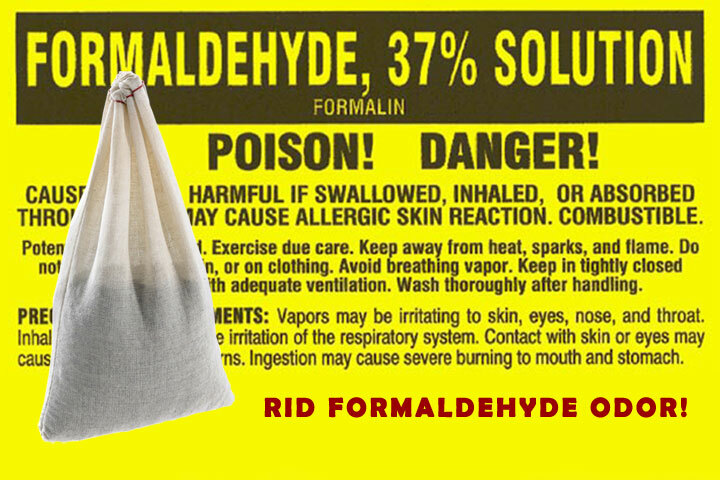 Just what is formaldehyde and why is it so important that you remove the obnoxious odor from your home or office? First, it’s an extremely important chemical that is used both in the manufacturing of building supplies and in several household products. As it’s also found in combustion and some natural processes, you’ll find it both outdoors and indoors. If you went looking for it you would also find it in pressed wood as the adhesives contain urea-formaldehyde (UF) resins. Most homes have a selection of pressed wood in shelves, cabinets and self-assembly furniture. Decorative plywood paneling, drawer fronts and furniture tops include the resins. You will find that, among wood products, medium density fiberboard has the highest ratio of resin to wood. You will smell it when you open the box from the store as you wonder how to put the furniture together. Phenol-formaldehyde (PF) resins are found in plywood or strand board often used for outside construction, but with lower emissions than UF resin. The smell will be stronger when the wood is new and will fade over time. And if you’re thinking that this might not worry you too much, you’ll also come across it in nail salon products, cosmetics, embalming solution, industrial fungicide, germicide and disinfectant. The colorless gas with the pungent odor can make your eyes water. Your eyes and throat may feel like they are burning. You might feel sick and some people have difficulty breathing. Therefore people with asthma are at risk. Some people can be sensitive to formaldehyde, which can be a carcinogenic in both animals and humans. If you feel tired, develop skin rashes or a strong allergic reaction, you should mention the possible connection to your doctor. Moving into a new home? Your moving company won’t know this, but your home may have been built before the current guidelines for control came into being, so exposure to formaldehyde may be higher than the law now allows, especially in confined places. What Can I Do To Clear The Smell And Emissions? The amount of heat and the level of humidity have adverse affects on formaldehyde emissions. Using dehumidifiers and air conditioning to control both temperature and humidity can help lower the emissions, but at a cost: a higher electricity bill and more damage to the environment. Ventilation is an obvious way to help clean the air. Try to use exterior grade wood as it uses the lower emitting phenol resins. So Which Products Will Help Me? Use products to clear your home or office from the odor. The Smelleze™ Formaldehyde Absorbent Pouch is easy to use. You simply place it near the odor and you’ll be able to smell the difference immediately. It clears the odor rather than just covering up the smell. It’s safe to use this environmentally friendly product. It’s non-toxic, natural, non-caustic and completely odorless. You’ll see an immediate difference as it improves your air quality. If you hang the pouch near the return air duct of your ventilation system you’ll smell the difference straight away. When you feel the pouch is becoming less useful you can hang it outdoors in direct sunlight for a day. Then you’ll be able to use it again and again, by using this simple cycle. It should work for years, making it extremely cost efficient. Finally, once you’ve finished with the contents of your pouch, you can use them as fertilizer in your garden. The contents are natural, non-hazardous and environmentally safe. If you water thoroughly after spreading in areas where you want growth, it acts as a slow release fertilizer and just as importantly, helps to keep your soil moist. Alternately, you can use a granulated version of the same product. Instead of using the pouch to attract the formaldehyde odor, you simply sprinkle the granules over the area causing you trouble. I have a drawer that picked up a really bad, strong, chemical smell. I think the source was a plastic/rubber mix type handle of a flashlight. (The flashlight always smelled weird.) I put the flashlight in a drawer with a candles, a box, metal and plastic items. A mix of things. Anything that was porous picked up the bad smell. Hard plastics picked it up less. I have emptied and cleaned the drawer and tried the household Smelleze granules but the smell continues. I don’t know what the smell is but I suspect it is formaldehyde because it permeates everything. Can you help me find a product to try to eliminate the smell. I would suggest using our Smelleze™ Formaldehyde Odor Neutralizer Granules: 2 lb. in the drawer and leave the drawer open to allow air flow. I have in odor in a house that I remodeled. The Smell developed after 6 months. To me it smells like ammonia, and after opening the windows it will dissipate quickly until the windows are closed and the next day the smell is back. Does formaldehyde smell like ammonia and will your product remove other smells beside formaldehyde. The house is a weekender with all new everything. If you are dealing with an ammonia smell i would recommend using our AmmoSorb™ Reusable Ammonia Removal Pouch throughout the house. I AM BEING POISONED BY MY NEIGHBOURS WITH HIGH DOSES OF FORMALDEHYDE WHICH WHEN “STATIC” REACHES 1.35 PPM ON MY EX TECH VFM FORMALDEHYDE AND VOC DETECTOR. THE NEIGHBOURS HAVE ALSO USED SOME METHOD OF GASSING ME DURING THE NIGHT WITH FORMALDEHYDE. HAVE NO READING AT THESE HIGH POINTS AS I HAVE TO RAPIDLY VACATE MY HOUSE ON THESE OCCASIONS. THE LAST TWO “GASSINGS”IN OCTOBER WERE DEFINITELY DESIGNED TO KILL. MY SON’S DOG WAS STAYING WITH ME ON ONE OCCASION AND BECAME VIOLENTLY SICKNOW AFTER WE LEFT THE PROPERTY. I HAD THE SMELL AND TASTED OF KEROSENE? IN MY THROAT FOR 5 DAYS. DURING THAT TIME THE DOG SHIED AWAY FROM MY FACE RATHER THAN RISK THE FAMILIAR SMELL WHICH MADE HER SO ILL. I CANNOT LIVE IN MY HOUSE ANYMORE. THERE IS ALSO AN UNDERLYING SMELL OF KEROSENE PERMEATING THE HOUSE AND A SMELL OF ACETONE. THEY ARE DRUG ADDICTS AND VILE CREATURES. Bought older house and SOB board is in Utility room. 30 X 20 smells bad. How to get rid of the order and how many bags to buy? I would recommend using at least 4-5 Smelleze® Reusable Chemical Smell Deodorizer Pouches to eliminate the chemical odor from the air. My name is Mike from Enugu in south east nigeria. I need help on where to buy your odor controls and how to apply them. Is it available here in nigeria, if so can you send me the contact address in nigeria. If not how can l get it directly from you. Thanks. I purchased a dress from an overseas factory. As soon as I opened the package, a strong odor overwhelmed me. The dress smell was horrible. I threw it in the washer and after 3 washes, the smell is still there. My chest started getting tight and it is now morning and my chest hurts. I hung the dress outside to get it out of my house. I’m not sure if it’s formaldehyde. If it is, how can I get it out of the dress? If not, where can I get it tested? I would recommend using Odoreze™ Natural Laundry Deodorizing Additive to get the chemical odor out from your clothing. I am waking up short of breath. My room has water damaged wooden laminate flooring. How can I solve my health issues? Should I move? I’m worried about the long term effects as well as the short. We are not qualified to give medical advice, however if you are dealing with a musty smell from the water damage to your floor I would recommend using MoistureSorb™ Reusable Moisture & Odor Absorbent Pouches to eliminate strong mildew smells. As an added benefit, this product will also absorb excessive moisture to help prevent mold growth. I bought a new sofa, made in Canada, and the smell just doesn’t go away. It has been 4 months. How long does it take for such a smell to go away? I have never smelt anything like it. The arms seem to smell the most. The seat and back cushions do not smell except for the ones closest to the arms. What is in the arms that make it smell like dirty old socks/sour/uriney/toenail fungus/. I tried my best to describe what I smell. I can only sit in the middle of the sofa but I still get whiffs of it and I get upset that I can’t enjoy my sofa and instead I go and stay on my bed. This is very upsetting as I spent a lot of money for a new sofa which I don’t do in my lifetime because they are so expensive. But now that I did, I am depressed over it. I want to know what it is and why from the arms? Maybe it is in the frame too. Who would’ve thought a brand new sofa would smell so bad? This shouldn’t even happen in this day. Unfortunately i cannot tell you exactly what the odor is and where it is coming from or why it is there simply because we did not make the product. However, we get this odor problem a lot and it seems to stem from the furniture out gassing chemicals that were used in the making process of the furniture. I would recommend using our Smelleze™ Natural Chemical Odor Remover Powder over the sofa to eliminate the odor. As an added benefit you can use our Smelleze® Reusable Chemical Smell Deodorizer Pouches to eliminate the bad odor from the air. Hi, we purchased an RV, the smell itself has finished but every time I sleep in here I am sick to my stomach, my throat hurts,eyes etc. I am very sensitive to chemicals. So here is our question, will your wonderful product remove and or lower actual formaldehyde levels or used more to get rid of annoying smell? Thank you!